Our breeding group is what makes us have the most wonderful puppies. We look hard for dogs that have great personalities. The golden and aussie doodle puppies get those amazing traits. Don’t wait on getting one of these puppies! Our beautiful and intelligent breeding group is the best! Our breeding group is the base of our wonderful puppies! We look long and hard for family-friendly dogs that will pass on a great temperament for family companions. Our home grooming jobs aren’t professional quality, lol, but you can see their sweet natures and good conformation. Some of our breeding dogs are in guardian homes, which means they are a family dog with another family in between litters. If you are interested in offering your home, please contact us and let us know. It takes a very special home that not only will give a dog an excellent home (which we strive for all of the puppies), but will also be close by and work with us on cycles and transitions. Meet Mia and Red’s girl, Zuri, born December of 2017. She is certainly a joy to the family as she is companionable and mellow. We love her sweet temperament and beautiful color. Her litters with Alonzo will be a great combination! We’re not sure of her timeline yet, so her first litter could be anytime from March to July. We’ll let you know when she comes in season and is bred. Cheese is our youngest Golden Retriever, with her first two litters adopted, and many more to come. 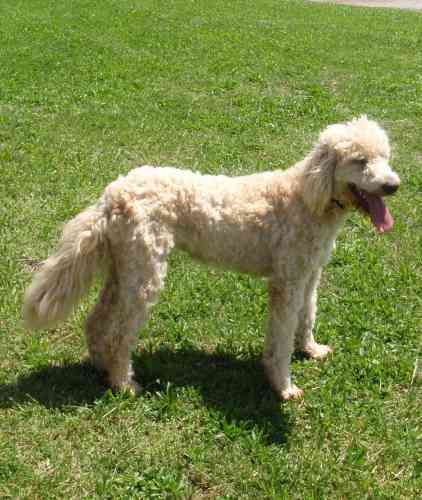 She weighs about 50 to 55 pounds and brings in English Cream lines to our Goldendoodle selection. We are all very pleased with Tiana's pick for her college fund, and we expect the variety she brings to our puppies to be exceptional family companions. Her calm and easy-going attitude match her affection and intelligence. When Belen started looking for this girl, it took her 4 months to find the perfect mother. Lanna is the calmest Australian Shepherd I've ever met. She is still an Aussie, with all the intelligence and eagerness of the breed, with a mellow attitude that makes her puppies easy-going and easy-learning. We enjoy her puppies so much and love hearing about how well they are doing in their new homes. Sally was named by Micah, the littlest child, and she is as sweet and fun as her name. Her litters with Alonzo, spotted red and white, are gorgeous. We are looking for many more years of beautiful puppies from this gal. She weighs about 45 pounds. Rue is an F1 Aussiedoodle from Rylla and Enzo who shows the best of both breeds. She is active and eager, like the Aussie, as well as stately like the Poodle. Her coat was a rich chocolate brown as a puppy and she has silvered to a pretty golden brown. Some of her puppies might silver out, also. She and Alonzo have sweet, spotted puppies that will be anywhere from 35 to 70 pounds depending on the puppy. She weighs about 50 pounds. We kept a sweet girl from one of Happy and Red's litters, and she is as sweet and mellow as her mom and dad. She has had two litters so far with more to come in the spring of 2019. Keep watching for news! She will make F1b puppies with beautiful, mellow temperaments. 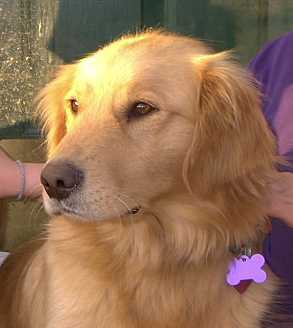 She has a guardian home in Bowling Green where they love her and she loves being a part of their family. Our son Shelvin had been looking for a Golden Retriever to help pay for college expenses, and Alonzo is such a willing contributor. He found a beautiful red-gold girl, and drove over 6 hours one way to bring her home. Mia came into our family and accepted everyone willingly. She is energetic and loves to run, but is calm and mellow inside the house. Sunset's Fancy Foo is from an excellent breeder in Ohio and is as cute and sweet as any of our puppies. We fell in love with her puppy picture and brought her home to play; you can see the girls got hold of her. Her coat is soft as down and a beautiful white. She weighs about 60 pounds and has beautiful conformation. We have found a new boy that is sweet and mellow, just what we look for! His red and white coat give us some gorgeous colors. His puppies are sweet and well-tempered and love the family life. He is intelligent and intuitive and loves to be out with the kids. He is also available as a stud (50 pounds). 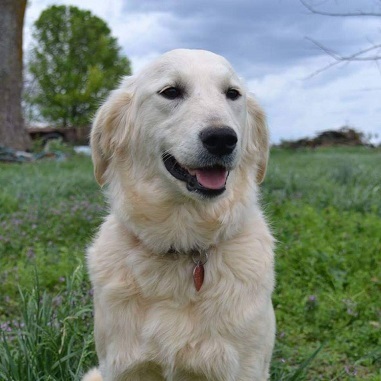 Aria’s first college/mission fund puppy was a beautiful purebred Golden Retriever with near-perfect conformation, but most important, she has a sweet personality and is obedient and intelligent. Happy is the most mellow and calm, the largest of our moms. Her wait list was usually nice and long, since she had a fan club for her beautiful puppies. She is in her retirement home where foster kids and dog sitting is the norm. She is still serving and loving! 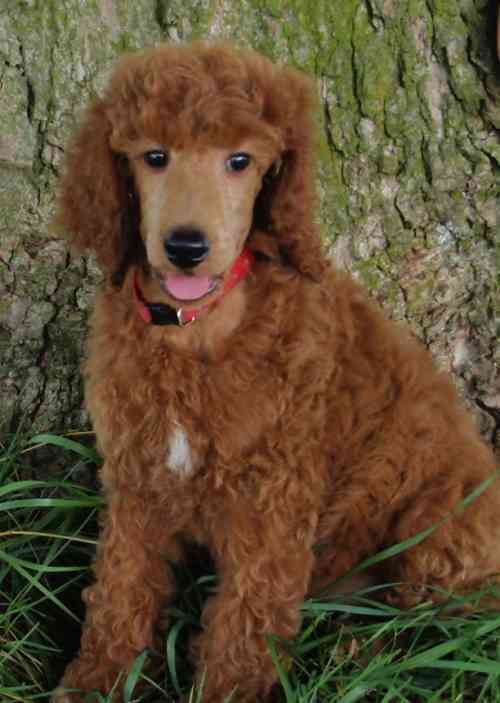 Red was our sweet purebred Poodle sire (62 pounds) for our red Goldendoodle litters! We just loved his color, and he is sweet and friendly with his own quirky personality. We have found him to be intelligent, loving, and did I mention his gorgeous color?! He has been a stud for other families as well, and has had a few of his puppies in ads and in print. 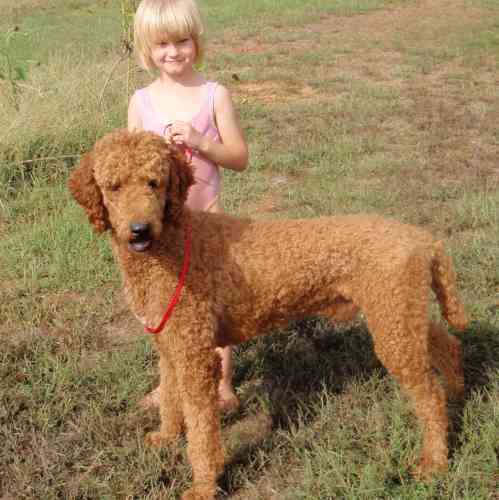 His color and sweet temperament are consistent in all the Goldendoodle puppies he has sired. He is now in his retirement home being pampered and waited on by the two of the most adorable girls in Louisville. Sunny Side Coquette (47 pounds) is a beautiful cream Goldendoodle we kept and raised the summer of 2008. She is in a home where they are working on hospital therapy with her. She is such a sweet, sweet girl and loves to be with people. Meet Belén's first dog (45 pounds), a cute and sweet Australian Shepherd. Many years ago, anticipating college expenses, Belén took matters into her own hands and researched Aussiedoodles. She really likes the mix and adopted Rylla as a puppy. Her litters, in addition to grants and scholarships, completely supported her schooling and she graduated with two degrees debt-free. Rylla is now a happy farm dog on great-uncle Dan's acreage. Our Caramel Sundae of Sunset, aka Buddy, says hello! He was the stud of our Goldendoodle litters for two years. He was adopted to train as a therapy dog for the elderly in Texas and is doing great with his new family. We get to see him when we visit Grandma. Our page would not be complete without pictures of Blondie. Papa and Skeeter (Grandpa and Grandma) gave us Blondie as a puppy many, many years ago. She is our foundation mother and gave us our first F1b moms. She had many good retirement years living down the road with a lovely family with kids, but her life span has long passed. She has set the standard for our family-friendly dogs and healthy constitutions. She is what we continue to strive for in our moms and puppies.